When celebrating and performing pujas and rituals on Ganesh Chaturthi or Vinayaka Chaturthi, please make sure that you buy Eco Friendly Natural Clay Ganesha. Hinduism and Nature are so entwined that one cannot be separated from another. Ganesha itself is a classic example of the role of Nature in Hindu religion. But still we Hindus do little to stop pollution. At least we can stop creating more pollution in the name of Ganesha by only buying natural clay Ganesh idol and natural items for Ganesha Puja. How to Make Your Ganesh Chaturthi Puja Real and Eco Friendly? Buy only natural clay Ganesha - make sure the paint used is natural. Reuse Metal Ganpati Every Year. Use only natural materials for Ganesh Puja. Do not throw puja materials in rivers. When you use natural puja materials you can dig a hole and put them under a plant. Perform Ganpati Visarjan at home under a tree or plant. Create awareness about natural eco friendly Ganesh Chaturthi festival. The glossy Plaster of Paris Ganesh idols with chemical paint is good to look at but when it is immersed (Ganesh Visarjan) in water it creates water pollution. Plaster of Paris Ganesh idols take months to dissolve in water and it becomes a breeding ground for harmful germs. The chemical paints used to decorate the Ganesh idols contain heavy metals such as mercury and lead and this enters the water and this very same water is used by humans. The environmental pollution caused by Ganesh Chaturthi Puja is constantly increasing and this is a shame for Hinduism which derives inspiration from Nature. Traditional Ganesh Puja is always performed using clay idols. We spend hours decorating Lord Ganesha and his temporary temple with thermocol and plastic during Ganesh Chaturthi festival. But after the festival these non biodegradable wastes are thrown in a water body, sea or river along with Ganesh idol. This plastic and thermocol waste cause environmental problems and pose health hazards. The valuable hours you spend in decorating Lord Ganesha can also be done with eco friendly clothes, garlands and shawls. All traditional Hindu festivals are deeply rooted in nature. 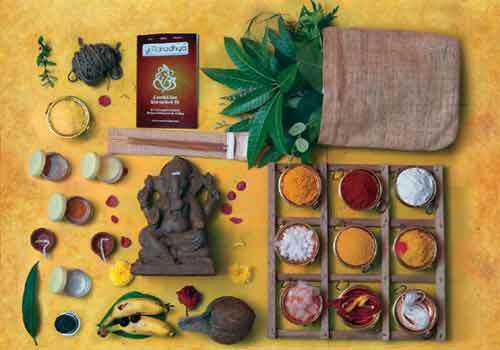 Traditionally only natural products are used in Hindu rituals. Why? Hinduism is rooted in Nature and the best example to this is Lord Ganesha. Plastic, Plaster of Paris, thermocol and other cosmetic items might be attractive to the eyes and may be less expensive and easy to use and easily available. But they are not traditional puja items and their use reflects cosmetic spirituality. eCoexist, a Pune based NGO, is setting an example by introducing disposable temples, garlands and shawls made from eco friendly products especially for Ganesh Chaturthi. All these decoratives is made using left over fabrics and provide an eco-sensitive livelihood to women living in the slums of Pune. Even the garlands are made using clothes. eCoexist is selling them as a kit which includes one temple with either one shawl or one garland. If you are not interested in buying, you can make use of the ideas used by eCoexist and create your own Ganesha temples from clothes and other natural materials. Aluminium foil plates and decorations. Even if you are using plastic items for puja, please do not throw them into river and lakes. Use only natural materials in puja. Real tradition is using natural materials for puja. Where to Get Traditional Ganpati Murtis for Ganesh Puja? 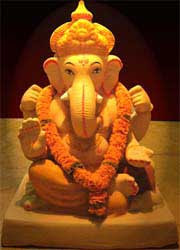 There are numerous organizations that are making natural clay Ganesh idols. eCoexist, a social enterprise located in Pune, distributes Natural clay Ganesh idols in Mumbai and Pune. Various shapes and types of Natural Clay Ganesh idols are available at eCoexist. Nilesh Tupe of Nerul Sector 10 sells Ganesha made from cow dung. Centre for Environmental Research & Education (CERE) is conducting eco-friendly idol-making workshop for children on September 9 from 2 pm to 4 pm AT: Education Centre, Dr Bhau Daji Lad Museum, Byculla East (Mumbai). Call: 23731234 Cost: Rs 150. Sprouts Environment Trust in Mumbai. Ganpati Makhar environment friendly designs in Pune. In Hyderabad Planaplant (09347690690) is providing eco friendly Ganesh murtis. In Chennai NGO Sevalaya in Kasuva village is providing eco friendly Ganesha you can call Ravi 9444167625/ Ganesh 9094766806 to place your orders. Sangeetha Saravanan of Sangeeni’s Raise The Earth in Mandaveli in Chennai too is taking orders on 7358552372. Clay idols of Ganesha are also available at Kandanchavady, Perungudi and Kottivakkam in Chennai. For details contact S. Balakrishnan on 9385907050 or Jayshree of Sri Krishna Garden Needs on 9840028852. A one foot tall clay Ganesha idol along with a 9 inch pot, flower seeds, manure, erukkam garland, paper umbrella and flowers at Rs. 280. How to make natural clay Ganesh idols? How to perform Ganesha Puja?